With the first incarnation of the World Boxing Super Series coming to a close in the near months, I thought it was only right to look back on the brain-child of Kalle Sauerland & Richard Schaefer but also to look forward at what could be for 2018/19. To produce a real shake-up within the boxing industry, Sauerland and Schaefer (sounds like a nice German detective thriller) needed big names, big money, big arenas but, most importantly, big organization. Take the Super Six World Boxing Classic which was rife with issues – I mean first up, that name is a mouthful – but the main issue was it’s confusing group stage format combined with the fact it took place over two years resulting in an unsaleable product. I’m still struggling to work out how Artur Abraham lost two of his three bouts yet still made the semi-final AND how Glen Johnson only had one fight in the group stages… nine years on and I’m still confused! Evidently, then, the WBSS needed to promise something far simpler and in a bracket-style format with 8 RANKED fighters per division taking place over 9 months – a simple, easy-to-follow format. Therein lied the main attraction to this event and the fact that all four cruiserweight champions signed up made for mouth-watering encounters – the Super Middleweight tournament didn’t quite have the same level of razzmatazz with relative unknowns Avni Yildirim and Rob Brant signing up alongside, the only recognized world champion, George Groves with Jamie Cox, Chris Eubank Jr, Erik Skoglund, Callum Smith and Jurgen Brahmer making up the numbers. Looking to innovate from the start the proceedings kicked off with a draw whereby the four seeded fighter got to pick from the four unseeded fighters to determine who would fight who – putting the power into the hands of the fighter. This produced a tasty clash between Groves and Cox whereas other fighters (Chris Eubank Jr, I’m looking at you) blatantly picked the easiest fight possible (against Avni Yilidirim) although to be fair that was Snr’s choice. The fights throughout were of a high quality – especially in the cruiserweight division – but the promoters missed a trick in not having the defeated men fight on the following undercards. One of the most spectacular talking points of each fight night was, well, just how spectacular the Sauerland’s managed to make the arena’s and atmosphere’s through, mainly, just incredible lighting and packed crowds. Unfortunately the whole series encountered the first snag when Brahmer withdrew from the semi-final against Callum Smith on the Monday fight night – too late to postpone the whole event, apparently – and unknown Dutchman Nieky Holzken stepped in to fight the British “Diamond” Champion. Holzken put in a spirited performance and was far better than many expected in pushing Smith the full 12 rounds although, having said that, Smith was far from impressive but it reinforced the issue that if fighters got injured it through the whole tournament off course resulting in either heavy postponements or sub-par fights. Imagine if Holzken beat Smith – would he have gone on to face Groves (presumably, yes) or would Brahmer have been able to challenge him beforehand. Certainly from a legal perspective I’d suggest he’d have a solid case. A questionable choice from the promoters was to hold the cruiserweight final between Oleksandr Usyk and Murat Gassiev – for ALL the belts – in Jeddah, Saudi Arabia. By all accounts it’s set to be the first fight held in the Arab country but garners all sorts of controversy not least because it’s uncertain whether women will be allowed to attend but, also, it alienates much of the Usyk / Gassiev fan-based in addition to the main Western markets for ticket sales. Let’s be clear though across the cruiser tournament we have been blessed with insane fights starting off with Mairis Briedis vs Mike Perez in the quarter-finals before two barnstormer semi-finals between Usyk-Briedis and Gassiev-Dorticos. You literally could not ask for more. Rumours already abound the 2018-19 editions of the World Boxing Super Series with the main focus being on what weight division will be featured – it is my understanding that the Super Lightweight and Bantamweight categories will be the two picked by the Sauerland brothers. Looking ahead at the 2018-19 version it’s unlikely the same level of prize money will be levied at the 16 fighters – a total of $50million was on offer for the two inaugural brackets – with the lower weight divisions seemingly courting less money but that’s not to say we will see any less superfluous action. The WBSS have worked miracles already but should they managed to put together a Zolani Tete vs Ryan Burnett unification fight – who knows, maybe in Belfast – then they will have truly managed to pull off something special but it’s not just those two who could be in action, Jamie McDonnell, Paul Butler and Lee Haskins would all produce sumptuous match-ups. Venturing into the super-lightweight division and it’s questionable whether all four champions would enter – far more likely to happen in the bantam division – but the likes of Terry Flanagan, Kiryl Relikh, Adrien Broner, Josh Taylor, Regis Prograis, Anthony Yigit, Jack Catterall and Julius Indongo are all realistic possibilities that would promise to entertain. 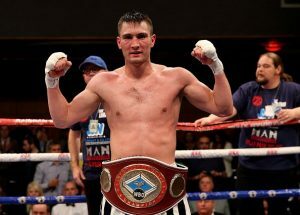 Speculation aside though there’s only two fights we need to focus on at the moment and that’s Usyk-Gassiev on the 11th May for the UNDISPUTED cruiserweight champion of the world and Groves-Smith in July, Manchester, for the WBA Super-Middleweight belt. With the controversial Ward v Kovalev rematch slowly fading from memory and the beginning of their press tour, thoughts now turn to September’s much anticipated mega fight between Gennady “GGG” Golovkin and Saul “Canelo” Alvarez. Early odds have Golovkin as a slight favorite at -160 while Canelo currently sits at +140. The clash of these two men, who are both known for their punching power, certainly has the potential to be explosive. The two men are seasoned veterans, having accrued large fan bases, high profile and fearsome reputations over their long careers. Golovkin had a very extensive amateur career where he won a world championship in 2003 and an Olympic silver medal in 2004, both at middleweight. Since turning professional, GGG has accumulated 37 wins with an incredible 33 of those wins coming by way of knockout. This amateur pedigree combined with his destructive power and until recently, his relative ambiguit, has meant he has been very much avoided for a large portion of his career with his toughest fights coming in the form of Canadian David Lemiuex and Brooklynite Danny Jacobs..
On the other hand, Canelo turned pro at the age of 15 and after a few formative years fighting on the domestic scene in Mexico, he began to gain notoriety. He made is pay per view debut in 2010 on an HBO card headlined by Floyd Mayweather v Shane Moseley. Since then, a string of high profile fights have made him a household name and a superstar in his native Mexico. His resume is incredibly impressive featuring wins over Miguel Cotto, Alfredo Angulo and James Kirkland with his only loss coming via a majority decision to Floyd Mayweather Jr, the best pound for pound fighter of his generation. Even his recent fights for which he has been criticized have been against three current of former world champions, all of whom me made look very average. Amir Khan has some of fastest hands in boxing, Liam Smith was an undefeated world champion and Chavez Jr was a former WBC middleweight world champion. Part of the reason so many have begun calling Golovkin’s name in recent months is because he has slowly begun to look more and more human. Cynics will point to the tightening of drug protocols as a possible reason for this. Golovkin won his fight against Brook, ultimately in convincing fashion, however at points he was outboxed by the lighter Brook and at least once, looked like he was hurt. The Brook fight raised questions about what would happen if he was confronted by an elite fighter who was a natural middleweight. Daniel Jacobs was that fighter and ended his knockout streak that had lasted since 2009. In what was an incredibly close fight, Golovkin looked spent in the late rounds as Jacobs came back at him hard after an early knockdown. It is against this backdrop that Golovkin takes on what is by far the toughest test of his career. The two men are both big punchers and Golovkin, courtesy of his trainer Abel Sanchez, fights like a Mexican too. The prospect of these two men standing and trading in the middle of the ring is a thrilling one and is a big reason why this fight transcends into the casual market. Both men’s chins remain relatively untested however, there is no doubt they can take a punch and the possibility of the fight going to the judges is very real. Canelo cedes about an inch in height to Golovkin but has a longer reach, measuring in at 179cm compared to Golovkin’s 178cm. As a result, there isn’t much to differentiate between the two there. Canelo boasts 34 KO’s on his record but definitely doesn’t pack the same power at Golovkin does. However, Golovkin is now 35 years old and for many, is quickly moving past his prime. In contrast, Canelo is 26 and coming into his peak years. Age brings with it stamina issues and decreasing power which seem to be sleeping into Golovkin. As a result the longer the fight goes, the better the chance Canelo has. Canelo has traditionally struggled with the quicker and more technical, fighters such as Lara, Mayweather and briefly Khan. Canelo faces an entirely different prospect here. Golovkin, is yet to fight a genuinely elite fighter: Brook was good but far too light and Lemieux and Jacobs were very much B class world champions. Canelo is pretty experienced at the highest level but has never fought a man of comparable size and power, whilst Golovkin is more untested in a broader sense. This raises the questions which makes this fight so intriguing. For me, Canelo’s stamina, experience and recent track record make him a slight favorite. However, it truly is a pick em fight and there really is nothing between these two men. Mexican superstar Saul “Canelo” Alvarez is something of a fighter without a home. Indeed, it’s hard to know how to identify the 47-1-1 boxer. He is considered the lineal middleweight champion of the world, though he has yet to engage in a major bout at or near the 160 lb. middleweight limit. He’s fighting Liam Smith for a junior middleweight title this weekend, but may then jump up to middleweight afterwards (“may” being the operative word here). Indeed, the man has even proven to be comfortable fighting at his own 155 lb weight limit. Needless to say, fans can’t be blamed for being confused. Kell Brook, for instance, was a welterweight who moved up to middleweight. Since he was defeated by Gennady Golovkin this past weekend, it appears he’s now going to fight at junior middleweight (while presumably ditching his IBF world welterweight title). Such clarity can’t be found when it comes to Canelo, a fact which has led to more than a fair bit of resentment among boxing’s fan base. Again, fans can’t be blamed for being unhappy. Still, it’s a shame to see Canelo’s reputation taking such a hit, especially when one considers the fact that most of this public relations mess could have been avoided. 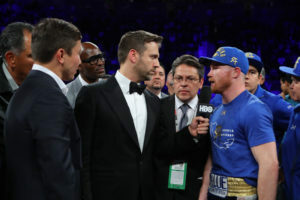 Canelo may have largely been an unknown commodity among casual fans before facing Floyd Mayweather in a 2013 superfight, but his career trajectory, as well as his demeanor, after that one sided loss to the pound for pound king earned the red haired fighter many accolades. What’s more, those accolades were well deserved. For, after besting Alfredo Angulo, Alvarez went on to face the very talented and slick Erislandy Lara –supposedly against his promoter, Oscar De La Hoya’s, wishes. Make no mistake about it, Lara was a dangerous fight. Yet Canelo took it and won it by close, albeit controversial, decision. The man then went on to battle enormous star Miguel Cotto after destroying hard fighting James Kirkland in epic fashion in Texas. To be sure, it took what seemed like forever for the Cotto fight to come together. One could even venture to say if Cotto-Canelo hadn’t occurred the same year as Mayweather-Pacquiao, the negotiations between the Cotto and Canelo camps would now be remembered as one of the sport’s great recent frustrations. The bout eventually went down, however, and Canelo won a close, lucrative and well watched contest. Something, however, had happened. In the buildup to the bout, Cotto had given up his WBC middleweight title, claiming he didn’t want to pay the World Boxing Council an expensive fee. Upon winning the fight with Cotto, Canelo became WBC middleweight champ, which meant he was now required to face middleweight terror Gennady Golovkin, who had been receiving step aside money. Looking at it all in hindsight, it’s tempting to argue that Canelo should have given up the WBC belt immediately after winning it…or even refused it beforehand. Sure, he would have taken heat, but perhaps it wouldn’t be as hot for the man as it is now. For the once widely lauded Canelo is now far less popular than he used to be. He may still have a huge fan base, but it’s a simple matter of clear eyed comprehension to understand the man’s reputation is now damaged goods. 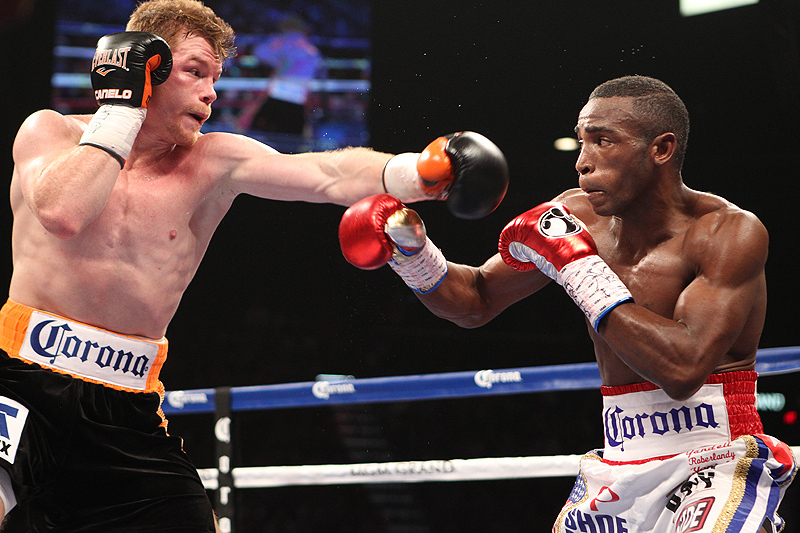 Make no mistake about it, Canelo is nowhere near as highly regarded as he was a year ago. And the fact that he is facing a widely unknown Liam Smith this weekend on a pay per view card isn’t helping matters. What, one may ask, would things be like now if Canelo – after having defeated Cotto – had politely given back the WBC belt while making it clear Cotto was his only goal, not the middleweight championship? What if Canelo had declared outright before he even fought Cotto that he wouldn’t accept the title should he win? No doubt, his reputation might not be where it is at the moment. Canelo wasn’t known as a middleweight before facing Cotto, after all. Sure, he was known to bulk up in between weigh in and fight time, but could he not have somewhat successfully argued that the Cotto match ultimately wasn’t about middleweight dominance, that being middleweight king had never truly appealed to him? Couldn’t he have argued that, after he got his dream match with Cotto, he was simply going to go about his business without being accused of being a pretend titlist? Indeed, he could have. Sure enough, he probably should have. There was no escaping the Catch-22 that came with fighting Cotto, not with Golovkin waiting in the shadows, but the damage could have been far less if Canelo and the gang at Golden Boy had simply played their cards right. They didn’t play their cards right, however. What they did was feign interest in a Golovkin bout when the interest simply wasn’t there. They led the fans on with vague indications that a GGG bout would happen sooner rather than later when that was never to be the case. And then it all caught up with them. After the WBC, somewhat surprisingly, told Canelo it was time to put up or shut up regarding a Golovkin bout, he did something that might have been unthinkable just a year earlier: He gave up his title belt rather than face Golovkin. And so here we are. In truth, it’s all a bit unfair for Canelo. It seems all he wanted to do was engage in an epic bout with Cotto. But like a seemingly great bill that works its way through congress, that particular fight came with a whole lot of attachments and amendments, so many that more harm may have ultimately come than good. The operative word here, of course, is “may.” No one knows what the future holds. Perhaps Canelo will face Golovkin in September of 2017, as some think. Perhaps he will try to age GGG out and fight the Kazakh when Golovkin is well past his prime. Perhaps he’ll simply refuse to fight Golovkin at all and let huge paydays cushion the public fallout, as contemporary businessmen-boxers do in similar situations. Or perhaps Canelo, Golovkin, or both, will lose before either meets in the ring (if they ever are to meet in the ring). All that’s certain at the moment is that Canelo is no longer generally viewed in the light he once was. And the window of time through which he can regain his reputation in all its former glory closes inch by inch with each passing day.